For a Free TV app or any app for that matter to be featured by Apple is phenomenal. Real Magic TV has an immense pedigree and was one of the original apps featured by Apple, way back in 2007. The Real Magic TV App has come a long way since then, with numerous updates and even more popularity. We were lucky enough to be pointed in the direction of this free TV app for iPhone and iPad and have certainly fallen in love with it. For those who don't know about Real Magic TV it's a phenomenally popular TV show that features the magic of Jonathan Real and has various megastars featured in the show. Through a combination of Jonathan's magic and charm the interviews take a turn from the normal and the stars show a totally different side of themselves to their fans. A really fun Magic/Celebrity show that has grown in popularity since its inception and featured Superstars like Lady Gaga and Maroon Five. 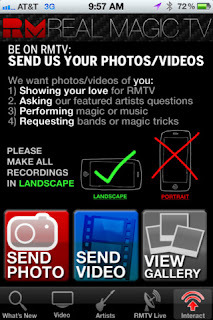 What makes the Real Magic TV app especially good is that it is not a single television channel for your Apple device but gives you access to many archived RMTV episodes and star profile. What is a brilliant piece of entertainment is the fact that the TV app is so interactive. Aside from having access to all the RMTV episodes , viewers/users can now get access to fan photos and submit their own photos. iPhone TV interaction is taken to even greater heights as app users can submit their own questions for their favourite celebrities to be featured on the show and even unbelievably submit their own videos. These are then shown on the app itself , in the fan gallery. Real Magic TV is a media phenomena that has grown in leaps and bounds from the Real Magic New York award-winning film. Now being distributed on many popular websites , most notably Hulu TV , the show is a definite favourite for Magic Lovers and anybody interested in musicians and celebrities being interviewed in a unique way and performing at their best. The fact that the television app is free and highly interactive should make it a must have for any fans or potential fans of a massively popular show. It's a great app from an awesome show! If you like Jason Mraz, Maroon 5, Gavin DeGraw or any of the top performers on NBC's the Voice, they have them all. 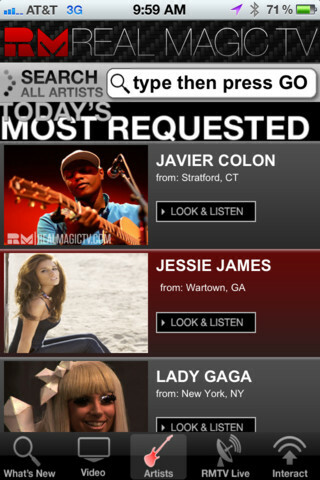 Thanks for the comment Jamie, it really is a fun little app with a wide range of popular divers artists.